An updated version will be available in Summer 2012. 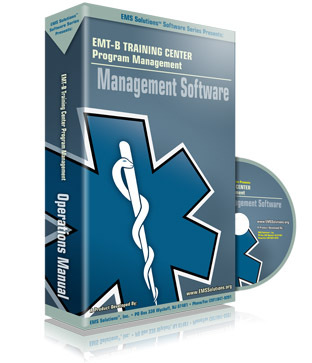 We at EMS Solutions have developed a Graphical-based approach to making your job of managing an EMT Training Program as simple as possible. Multi-User and Server-based Versions are also available. We have developed specific files/templates that perform the following functions: •General Administration allows you to plan and administer EMT Initial and Recertification courses by providing tools for obtaining course approval, budgeting parameters, course announcement flyers and application forms. • Faculty Personnel Records, allows you to maintain records on your entire faculty, including information on Courses taught and instructor recertification tracking. It includes automatic generation of expiration warning and suspension letters. A report can be generated at anytime listing the instructor and the course quantity instructed per course type. In addition, a Memo tool is provided for making brief, personalized or general announcements to the faculty. • Course Records for EMT, allow you to maintain records on all of your students on a per course basis. Each file provides student registration forms, packet cover letters, faculty assignment templates for station assignments, written test and skill record keeping and reports, automatic course rosters and pass/incomplete/retest. In addition, the cumulative records in each of these files produces the appropriate Quarterly Report on Training Center performance, automatically. • Course Records for EMT Recertification/CEU’s, allow you to maintain records on all of your recertification students on a per course basis. Each file provides student registration forms, packet cover letters, faculty assignment templates for station assignments, written test and skill record keeping and reports, automatic course rosters and pass/incomplete/retest. • Equipment Module provides maintenance tracking of your hard assets, with on-screen alarms for action items. A companion Inventory Module assists with tracking incoming inventory and the associated costs. • Advanced versions provides integrated support for using iPad’s in the classroom, for attendance, skills evaluation and performance parameter recording with direct updating of student records in the central database.